The second conference in the Crosbhealach an Cheoil (Crossroads of music). Held at the Magee campus of University of Ulster, 25-27 April, 2003; hosted by the Academy for Irish Cultural Heritages, organised by Fintan Vallely, Lecturer and researcher in Irish music 2001-03 (full data also in The Companion to Irish Traditional Music, 2011). This was the first of its kind in this part of Europe. 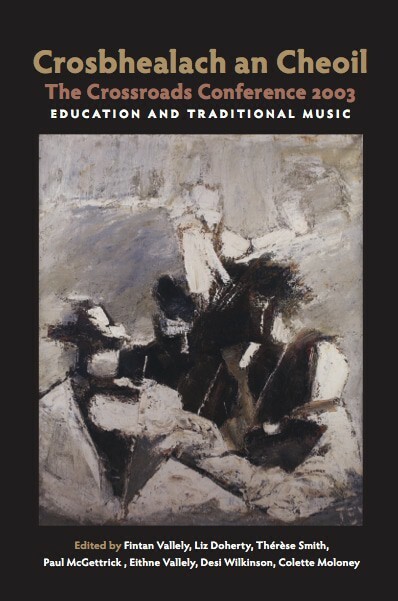 It concerned itself with the assessment and provision of Traditional music education at all levels from the practical to the academic, throughout the island of Ireland and abroad. While the concern and focus was on Irish Traditional music, the nature of investigation was comparative, an interchange of ideas and methodologies, taking in various other European Folk / Traditional musics covered as well – Norway, Scotland, Isle of Mann, Northern England, Newfoundland, Mid West USA and Brittany. Papers addressed group and one-to-one instrumental teaching of children in organised classes, summer schools and seasonal workshops, the specialised and well-established music schools, teaching from tutor books, CD ROMs, CD, videos and the internet. the variety of teaching contexts: past to present, learning from neighbours, parents, peers, organisations, summer schools, aurality/orality, travelling musicians, the written note, recordings, video, digital technology and the Internet – negatives and positives. Goals of teaching in music: artistic and creative purpose, aesthetics, fleadh cheoil standards, competitions, adjudication, the professional as role model, contradictions, closed versus open mind, examinations, grades. Teaching for the future: methodology that has been successful, pedagogy, failures, satisfaction, why do we teach music, problems in teaching singing, training the teachers. A feature of the conference was a concert performance by young musicians and singers from local (Northern) counties who are the visible beneficiaries of several strands of the instrumental and singing teaching programmes which exist today. All were high quality players, many of them award winners. Local Traditional singer and BBC presenter Brian Mullen hosted this event which was open to the public s well as conference delegates. Such concentrated and structured exposure to the result of practical music education strategies / practices was a hugely-informative ‘first’ for many of the delegates. The Verbal Arts Centre was chosen for this, a superb acoustic venue, the use of which took the conference out of the university into local cultural life, as well as introducing conference delegates to the architectural and historical features of the host city. In addition, on each of the conference’s three nights, a dedicated, club-style venue offered conference delegates the facility of casual performance of and listening to music and song, in the environment of further debate and discussion. Some thirty of the delegates played music and sang at these nights, making live music making a key feature of the experience of the conference. Dr. Colette Moloney, (Treasurer), lecturer in music, Department of Applied Arts, Waterford Institute of Technology; Dr. Liz Doherty, (Chair), professional musician, lecturer, musician & researcher, Buncrana, formerly lecturer in Traditional music at University college Cork; Fintan Vallely (Secretary), Academy for Irish Cultural Heritages, University of Ulster; Dr. Therese Smith, lecturer, Music Department, University College, Dublin; Eithne Vallely, Armagh Pipers’ Club/ St. Patrick’s Teacher Training College, Dublin; Dr. Desmond Wilkinson, lecturer, Mary Immaculate College, Limerick, professional musician & researcher; Paul McGettrick, Humanities Dept., Dundalk Institute of Technology. 36 papers and presentations were offered, some in parallel sessions in two venues within the college. 10 invited speakers were among these, in addition to the 2 keynote speakers. These and the 24 others were chosen to provide the maximum representation of the experience of teaching Traditional musics today. Keynote addresses were by Dr. Philip Bohlman (University of Chicago, author of The Study of Folk Music in the Modern World), and Dr. Caomhín Mac Aoidh (Donegal, fiddle-music teaching pioneer, author of Between the Jigs and the Reels). Debate was arranged in 12 thematically-focused sessions, involving 34 papers from Irish and international speakers. 15 of the papers were from the South of Ireland, 6 were from the USA, 5 from Northern Ireland, 4 from Scotland, 2 from Norway, and 1 each from Canada, England, Isle of Mann and France. 150 delegates were present on the opening night, and the level of participation at any moment on the debating days was between 90 and 100. Delegates came from Ireland, Northern Ireland, England, Scotland, USA, Sweden, Israel, France and Canada. They represented academic interests (university and teacher training, post graduate research), Traditional music (instrumental teaching, grades, competition, presentation and performance), and school music teaching. Eight bursaries for Crosbhealach an Cheoil were offered to students of Traditional musics in Ireland, Britain and Scotland. The object of these was to encourage further study of Traditional musics by introducing students to the intensity and depth of debate at an academic conference covering a field normally experienced only at the level of music making. The bursaries were made possible by a component of funding – that of The British Academy and Critical Voices (Ireland). The recipients were: Brian Keenan, School of Music, University of Ulster, Jordanstown, Belfast, Northern Ireland; Claire Gullan, Royal Scottish Academy of Music and Drama, Glasgow University; Ben Hudson, University of Newcastle Upon Tyne, England; Nicola Morrison, Lews Castle College, Isle of Benbecula, W. Scotland; Cinzia Curtis – Isle of Man, studying at Irish World Music Centre (IWMC) University of Limerick; Teresa Kavanagh, Northern Rhythms Programme, Falcarragh, Co. Donegal; Dominic Mac Giolla Bhríde, Dublin Institute of Technology School of Music; Edel McLoughlin, University College Cork. The evening concert at the Verbal Arts Centre featured 22 young musicians and singers from Armagh, Belfast, Tyrone and Fermanagh, all of them taught music in modern contexts. They were presented in a manner which presented for comparative evaluation three major transmission methods: dedicated teaching in organised classes, local influence and peer learning, and the challenge of professional role models. .
A display of ‘poster’ style presentations offered visible summations of activity by private, public and summer schools, colleges, etc. involved in the music. However (the only disappointing element of the weekend) this did not draw the expected, and promised, level of possible participation. All speakers agreed to contribute to the publication of papers; commitment for this has been secured from a publisher (Journal of Music in Ireland), and it is expected to be done on web in late 2010. This conference organisation was critically facilitated by the Academy for Irish Cultural Heritages at University of Ulster which hosted the bulk of the event’s services. It was facilitated also by personnel participation from the Department of Music at University College Dublin, the Department of Applied Arts at Waterford Institute of Technology, and the Department of Humanities at Dundalk Institute of Technology. It benefited greatly from the unwaged contribution of the independent committee members – Liz Doherty, Eithne Vallely and Desi Wilkinson. The event was financed (in order of scale) by Awards For All – Arts Council of Northern Ireland, The British Academy, The Irish Music Rights Organisation, Dundalk Institute of Technology, and Critical Voices (Arts Council of Ireland). Substantial on-site facilities and organisational work was provided by the Magee campus of University of Ulster, and promotional work, poster and design were contributed by Irish Music magazine. The conference logo The Blue Kimono was provided by artist Brian Bourke, artist JB Vallely contributed a valuable print for the funds-raising ballot to which instrument maker Malachy Kearns of Galway donated a specially designed bodhrán; the reception and night time facilities were courtesy of Sandino’s Café Bar. From November 2002 an extensive website – www.cros2003.com – provided the initial call for papers, and also ongoing full and updated information on the development of the conference. This continues, now with summary and follow-up information. In addition, promotion and interviews in the major presses, specialist magazines, and on specialist radio programming both on the island and, via internet, globally, provided a wider awareness of the event. Specialised discussion sites carried regular information too. A pre-conference printed brochure distributed at music events in the spring provided full basic information and programme details also. Finally, titles and summaries of all papers presented, background information and biographies of speakers, were provided on a printed conference programme distributed to all delegates. This document (c. 20,000 words, a complete conference preview and index, including all paper resumes, conference rationale and speaker biographies) is being made available outside of the conference and promoted on the website. Alistair Anderson plays English Concertina & Northumbrian Pipes. He has been at the forefront of traditional music in Britain for 30 years. Internationally acknowledged as a master of the English Concertina, he has appeared on TV, radio and the concert platforms across the world and has recorded and performed also with Popular artistes from Kate Bush to The Lindsay String Quartet, Richard Thompson to John Williams and from the Northern Sinfonia Orchestra to Nigel Kennedy. Bath International Music Festival commissioned Anderson and jazz trombonist Annie Whitehead to work together exploring the jazz/folk interface. The resulting work – Airplay – was performed twice at the festival and will tour as part of the Arts Council Contemporary Music Network early in 2003. Although working with others allows increased scope for his composing and arranging skills, Anderson is still best known as a soloist in traditional music from Northumberland, Scotland and Ireland and with his own music, which has grown out of his love of these traditions. Alongside his performance and composing schedule Anderson is involved in organising events to raise the profile of traditional music. He founded and is currently artistic director of Folkworks, an innovative organisation that has helped to change the face of folk music in the north of England, with large numbers of young people now discovering traditional music, song and dance. Folkworks is a founding partner in the new Music Centre Gateshead and, together with the Music Department of Newcastle University, has developed England’s first degree course in Folk and Traditional Music launched in Sept 2001. Anderson was presented with the Tyne Tees Television/ Northern Electric “Ambassador for the Arts” award in recognition of his work both as a performer throughout the world and in encouraging younger musicians to take up their local traditions. Margaret Bennett comes from a long family tradition of singers and pipers on the Isle of Skye — Gaelic on her mother’s side and Lowland Scots on her father’s. She has sung at folk festivals and concerts worldwide and, as one of the world’s foremost authorities on Scottish Folklore, she features in several films, TV documentaries and on radio. She holds an MA in Folklore and a PhD in Ethnology and currently holds an Honorary Research Fellowship at the University of Glasgow’s School of Scottish and Celtic Studies. She lectures part time at the Royal Scottish Academy of Music and Drama, and as a prize-winning author has published several books and articles. A folksinger of great sensitivity and versatility, she is a major figure of the modern Scottish Revival. Philip V. Bohlman is Distinguished Service Professor of Music and Jewish Studies at the University of Chicago. He studied at the University of Wisconsin-Madison, the Hebrew University of Jerusalem, and the University of Illinois at Urbana-Champaign, from which he took his PhD in 1984. His research and teaching cut across a number of disciplines and subject areas, but several of these unify his writing about and approaches to traditional music. His work on folk music first began in the late 1970s, with studies on the Irish-American traditional singer, Charles Bannen. Throughout his career traditional music has provided a counterpoint between studies of American folk music, especially ethnic and religious folk music, the folk music of German-speaking Europe and Jewish folk music. Among his major publications on traditional music are: The Study of Folk Music in the Modern World (Indiana University Press 1988); Central European Folk Music: An Annotated Bibliography of Sources in German (Garland 1996); The Folk Songs of Ashkenaz (with Otto Holzapfel, A-R Editions 2001); and “Jüdische Volksmusik” – Eine mitteleuropäische Geistesgeschichte (Böhlau Verlag, in press). His most recent books include: World Music: A Very Short Introduction (Oxford 2002), and The Music of European Nationalism: Cultural Identity and Modern History (ABC-Clio, in press). He has held guest professorships at Cornell University, the University of California, Berkeley, the University of Freiburg in Breisgau (Germany), and the University of Vienna. Currently, he also serves as Visiting Professor of Music at the University of Newcastle upon Tyne. A pianist and occasional button-box player, Phil Bohlman is also the Artistic Director of the New Budapest Orpheum Society, a Jewish cabaret troupe, whose first CD, Dancing on the Edge of a Volcano, appeared in 2002. Barry Burgess is a Lecturer in Music Education at the University of Ulster, Coleraine, course co-ordinator for Initial Teacher Education, and course director of the PGCE in Music Education. A teacher at second level for 22 years, he has been in university education since 1990, firstly in the music department at Jordanstown where he developed a module on Irish traditional music for the BMus degree course and latterly in the School of Education at Coleraine. He was a member of the ministerial working group set up by the Department of Education to write the Proposals for Music in the Northern Ireland Curriculum and has held external examinerships in Belfast, Limerick and Dublin. He has had a long term commitment to Irish music in the educational curriculum in Northern Ireland since the he was a research fellow at Magee College in 1975 producing materials for primary school called Bua an Cheoil. He contributed to the 1996 Crosbhealach an Cheoil conference with a paper: ‘Irish Music in Education ?- a Northern Ireland Perspective’ and also to the Journal of Music in Ireland, July/August 2001. Nicholas Carolan comes from Drogheda, Co. Louth. He is co-founder and director of the Irish Traditional Music Archive in Dublin, and general editor of its publications. A former teacher, he is well known as researcher and presenter of the RTÉ radio series The Irish Phonograph (1983–86) and television series Come West Along the Road (1995–2003). Archivist, researcher and collector, writer and frequent lecturer on Irish traditional music, from 1977 to 1992 he was secretary of the Folk Music Society of Ireland, and from 1985 has lectured on Irish traditional music in Trinity College Dublin. Among his published work is an edition of the first collection of Irish music A Collection of the Most Celebrated Irish Tunes of 1724 (1986), A Short Discography of Irish Folk Music (1987), A Harvest Saved: Francis O’Neill and Irish Music in Chicago (1997), and the article on Irish traditional music in the New Grove Dictionary of Music and Musicians (1999 edition). Cinzia Curtis began learning the whistle on the Isle of Man from Mike Boulton while in Junior School at the age of eleven. This led to an increasing interest in Manx Music, Dance and Language. While at Secondary school she taught traditional Dancing and Music to a wide span of ages, and performed on a regular basis as a musician, céilí caller and dancer both on the Isle of Mann and at inter-Celtic festivals abroad. In 1995 the school group in which she played, Paitchyn Vannin, took part in the National Festival of Music for Youth, performing at both the Royal Festival Hall and Royal Albert Hall, London, and later recording an album, ‘Fragments’, funded by the Manx Heritage Fund. As part of her BMus studies at Cardiff University, she edited and researched a music manuscript collection from the Isle of Mann, The Caine/Callister Flute Book, under the instruction of Dr. Fenella Crowe Bazin. This paper is part of her thesis on Creating Tradition being undertaken at the Irish World Music Centre, University of Limerick. Frank Claudy, a flute and tin whistle player from Washington, D.C., is a family physician whose work has prominently included musicians’ performance-related problems. He also holds a Masters Degree in Business Administration, and his present position as vice president of medical affairs at a large U.S. hospital affords him many opportunities to test theories of group behavior and adult learning. He is on the teaching staff at the annual Catskills Irish Week in East Durham, New York. Sean Corcoran is an internationally-renowned Traditional singer, lecturer and broadcaster. He is known for his extensive fieldwork in Irish music over many years, and presently collects for the Irish Traditional Music Archive, Dublin. Known for his performance with the highly acclaimed group Cran, he also lectures in Ethnomusicology and Irish Music at Maynooth College, National University of Ireland. Matt Cranitch is renowned as a fiddle player and teacher, both in Ireland and abroad. He performs extensively, and also presents lectures and master-classes. A graduate in electrical engineering and in music from University College Cork, he lectures at Cork Institute of Technology. He is author of The Irish Fiddle Book, and has contributed to other books on Irish traditional music. His most recent recording, Along Blackwater’s Banks with Sliabh Notes, was released in March 2002. He has a special interest in the music of Sliabh Luachra, and is currently researching a PhD on Pádraig O’Keeffe, at the Irish World Music Centre, University of Limerick. In recognition of this he currently holds a ‘Government of Ireland Senior Research Scholarship’ from The Irish Research Council for the Humanities and Social Sciences. He was a contributor to the 1996 Crosbhealach an Cheoil conference. Pierre Crépillon is a teacher of traditional music (bombarde, flute and clarinet) within the French system of music-teacher training at the Conservatoire de Rennes in Brittany. He is a founder members of Dastum, the Breton equivalent of the Irish Traditional Music Archive. Mick Coyne comes from a well known traditional music family associated with the Liverpool céilí band, with which his father Eamonn, from Co Roscommon, played fiddle, Mick began playing on tin whistle when twelve, moving on flute and pipes, and by sixteen was a regular in the band. His first set of pipes and piping lessons came from Co Clare piper Tommy McCarthy, and on moving to Dublin his friendship with the great ‘tight’ uilleann piper Andy Conroy laid the foundation for the style of piping Mick exhibits today. He has played at most of the major international festivals, and in 1990 he won the Oireachtas Uilleann Pipes competition. A teacher for a solo-piping class at the Willie Clancy summer school annually, he has taught throughout Europe and in Canada set up a traditional music program for Courtney College of Music in Vancouver. He grades piping scholarships granted by Na Piobairí Uilleann, and gives piping tuition at Limerick University’s music department. Administrator of the weekly Ennis Uilleann Pipers club, his solo CD is “Both sides of the Coyne”. Aibhlín Dillane is currently acting course director for the MA programme in Ethnomusicology at the University of Limerick, and next year takes up appointment as lecturer in traditional music at University College Cork. A graduate of UCC and the IWMC, she is currently completing a Ph.D. in Ethnomusicology with the University of Chicago where she received a Fulbright scholarship and the University of Chicago Century Fellowship to pursue studies. Her dissertation focuses on Irish Music in Chicago from the perspective of American ethnicity and the performance of place in the city. She has written on Irish music topics in the US, and is a contributor to the Companion to Irish Traditional Music. A traditional Irish flute and piano player, she played extensively in the Chicago-based band ‘Anish’, which released its first album in November, 2001. A former employee of the Irish Traditional Music Archive, she has undertaken undergraduate ‘World’ music surveys and adult education classes in Irish music at the University of Chicago. She is a member of The Society for Ethnomusicology, the International Council for Traditional Music and Comhaltas Ceoltóirí Éireann. Martin Dowling is a traditional fiddle player and historian. He holds a PhD in Irish history from the University of Wisconsin, and a Teaching Diploma in Traditional music from the London College of Music. He has performed, taught, and lectured on traditional music in Ireland and America. Since 1998 he has been an Officer of the Arts Council of Northern Ireland with responsibility for Traditional music. Janet Harbison was born in Dublin 1955 into generations of musicians and teachers. She began piano at the age of three in Dublin College of Music, and arising out of family connections with the Kerry Gaeltacht, and her attending boarding school in Waterford Gaeltacht, she developed an early love of traditional music, singing, dancing, playing tin whistle and guitar. She took up Irish harp in 1967, and in 1980 became the first harper to tour internationally with Comhaltas Ceoltóirí Éireann. With a BA in Music & Psychology, she moved to Cork in 1981 to study with Mícheál O Súilleabháin at UCC and teach harp at Cork School of Music. In 1984 she moved to Belfast to take up a Junior Research Fellowship award with the Institute of Irish Studies at Queen’s University, and in 1986 was appointed Curator of Music at the Ulster Folk and Transport Museum. In 1983 she initiated summer schools for harp, established The Harp Association in ’86, going on to organise the World Harp Festival, the Belfast Harp Orchestra and the charity, the Harp Foundation (Ireland) Ltd in Belfast in 1992 and in 1994. Having established harp schools throughout Ulster, in 2002 she moved to her paternal grandmother’s home in Castleconnell, Co. Limerick where she is now setting up a music school. Caomhín Mac Aoidh is a founder member of Cairdeas na bhFhidléirí and continues with it as an active Committee member. He is directly involved in the coordination of both the Donegal Fiddlers Summer School in Glencolmcille and the Annual Fiddlers’ Gathering in Glenties as well as numerous teaching workshops throughout the year. As a fiddle player he has both performed and taught extensively. His writings on both the Donegal fiddle tradition are numerous and include the book Between the Jigs and the Reels, several papers on educational themes, as well as three tutors on Donegal fiddle playing. Anne Dhú MacLucas is professor of music, specializing in ethnomusicology, at the University of Oregon, where she was previously dean for ten years. She is currently a Fulbright Distinguished Scholar in residence at the School of Scottish Studies of the University of Edinburgh, where she has been researching the impact of the academy on oral traditions in Scotland. Séamus Mac Mathúna is a musician and singer. He has been Timire Ceoil of CCÉ since 1969, and has been involved at all levels of that organisation since the late 1950s. A highly respected flute player, he has a particular appreciation of the music of his native West Clare, the South-Sligo style of flute-playing, and of the tunes and styles of Sliabh Luachra. In recent years he has been more prominent in traditional singing and amhráin ar an sean nós, with a detailed understanding of both traditions. The scope of his position in CCÉ, combined with his personal appreciation, input, and commitment to Irish music and singing, establish him as a significant contributor to the growth and development of Irish musical heritage. Karen Marshalsay is a Traditional harper involved in both performing and composing in Scotland, and also an experienced tutor in many contexts such as fèisean, schools, workshops, local authority projects and the Sabhal Mór Ostaig. Education initiative on Skye. Involved also with the RSAMD’s BA (Scottish Music) degree in Glasgow, she is currently working on that institution’s HOTBED project. Paul McGettrick is a lecturer in Music Technology at Dundalk Institute of Technology. He has designed and taught degree courses and modules in Irish Traditional Music at Dublin City University, Dublin Instituter of Technology, and Dundalk IT. A flute player, he is Associate Editor of ‘Sources of Irish Traditional Music c. 1600-1855’. Marie McCarthy is Associate Professor and Chair of Music Education at the University of Maryland, College Park, where she teaches courses on general music, music learning theory, music cultures in the classroom, and research methods in music education. She has received numerous awards, including a Fulbright Scholarship and an Outstanding Dissertation Award from the Council for Research in Music Education. She is active as a clinician and lecturer, has presented her work in all five continents, and has contributed to music education reform movements in Ireland, Lithuania, and Taiwan. Her research studies to date have focused on the sociocultural and sociohistorical foundations of music education, in particular the comparative study of music transmission, the relationship between music education processes in formal settings and those in the culture at large, and the impact of music education on the development of identity at individual and collective levels. Her major publications appear in the Bulletin of Historical Research in Music Education, Irish Musical Studies, Journal of Aesthetic Education, Journal of Research in Music Education, and the International Journal of Music Education. She serves on the editorial boards of several prestigious journals in music education, including the British Journal of Music Education, Bulletin of the Council for Research in Music Education, Journal of Research in Music Education, and the International Journal of Education and the Arts. Her major contribution to Irish music is her book, Passing It On: The Transmission of Music in Irish Culture, (Cork University Press, 1999). She is Section Editor of and contributor to the New Handbook of Research on Music Teaching and Learning (Oxford University Press, 2002). Mel Mercier has been a Lecturer in Music at University College Cork since 1992, where he teaches a range of academic and performance courses in Irish Traditional Music, Indian, African, and Javanese musics. He is a regular performer of Irish Traditional Music, composes music for theatre, and is currently researching North American, two-handed, bones-playing. Jo Miller grew up in Galloway, and trained at the Royal Scottish Academy of Music and Drama (RSAMD), Glasgow University and The School of Scottish Studies, Edinburgh; her postgraduate research focused on the musical life of her home area’s rural community. A singer and fiddler, she has taught traditional music widely, both in the community and in formal education. She created the BA (Scottish Music) degree at RSAMD in 1996, now concentrating on the development of community and pedagogical issues, and has developed resources and run in-service courses on traditional music for schools. She was on the Steering Committee for the Scottish Arts Council’s report Traditional Music in Scotland and contributed to the newly published What’s Going On? A national audit of youth music in Scotland. Colette Moloney comes from Charleville, Co Cork. She is a musician in both classical and traditional idioms and a music scholar specialising in the Irish harp. A graduate in music of University College Cork, she gained her Ph.D. from the University of Limerick in 1995 on the subject of the Bunting music manuscripts. A former director of the Ennis school of music Maoin Cheoil an Chláir, she now lectures in music in the Waterford Institute of Technology. Her major publication is the 735-page book ‘The Irish music manuscripts of Edward Bunting (1773-1843): an introduction and catalogue (Dublin: Irish Traditional Music Archive, 2001). John Moulden lives at Portrush, Co. Derry. A former Teacher in Controlled Schools who retired ten years ago from the principalship of an Integrated School, he is life-time singer and student of Traditional song who has published and lectured widely for more than thirty-five years. His main concerns are to make songs available to those who value them and to make accessible, to singers and others, rigorously researched information about the song tradition and about songs. Renowned for his work on the Sam Henry song collection, his most recent project has been contributing to The Traditional Music song Pack for Schools. Tom Munnelly is a song collector, archivist and singer. Born in Dublin, this prolific and dedicated field worker has made traditional song his life and has uniquely imprinted its society. With an intense interest in song and folklore he emerged from no academic background to produce by 1998 a prodigious volume of research, analysis and presentation. Beginning in 1964 he recorded traditional song in the field, from 1969 to 1971 he was research assistant to D.K. Wilgus, Professor of Anglo/American Folksong, UCLA, noting, cataloguing and describing narrative song materials (English and macaronic) in the Main ms Collection of the Irish Folklore Commission, covering some 1,750 manuscripts page by page. In 1970, with Breandán Breathnach, Prof. Seóirse Bodley and Dr Hugh Shields, he founded the Folk Music Society of Ireland (Cumann Cheoil Tíre Éireann) and still serves on its committee. In 1971 he became the first song collector for the new National Traditional Music Collecting Scheme then initiated by the Department of Education under Breandán Breathnach. In 1975 this merged with the Department of Irish Folklore at UCD, so leading him to lecturing on traditional song. In 1976, at the request of the Smithsonian Institute, he selected the twenty-five traditional performers to represent Ireland in the American Bicentennial celebrations, and was the country’s spokesperson and lecturer there. In 1978 he moved to Co. Clare, and from then until 1991 was chairman of the Willie Clancy Summer School. In 1981 he was appointed to the Arts Council’s Irish Traditional Music Archive Advisory Committee. In 1982 he founded An Cumann le Béaloideas agus Ceol Tíre an Chláir (The Folklore and Folkmusic Society of Clare), organising its lectures over nine years. Between 1983 and 1985 he was the Arts Council nominee to the board of Mid-West Arts, and in the same year, with Dr Hugh Shields of TCD and Nicholas Carolan organised the fifteenth International Ballad Conference of the Kommisssion fur Volksdichtung (Société Internationale d’Ethnologie et de Folklore). From 1985 to 1988 he was a member of the Arts Council of Ireland and from 1988 to 1993 was chairman of the Irish Traditional Music Archive (re-elected to its board 1995 and 1998). In 1990 he was chairman/founder of the Ennistymon Festival of Traditional Singing remaining a key figure in it until 2002, and also in 1990 was chairman/founder of Scoil Leacht uí Chonchúir (Lahinch Folklore School). Between 1990 and 1994 he also indexed all oral poetry (lyric and narrative, English and macaronic) in the first 2,000 vols. of the Main Manuscript Collection of the Department of Irish Folklore, generating some 18,000 cards in a self-developed system of cataloguing. Since 1971 he has recorded some 1,500 tapes of folksong (mainly) and folklore, the largest and most comprehensive collection of traditional song ever compiled in Ireland by any one individual. This is transcribed, indexed and catalogued using Irish, British, American and European systems of identification. He has lectured to practically every folkmusic and folklore body in Ireland, has talked in all Irish universities, and continues to give papers abroad every year. Siobhán Ni Chonaráin is a teacher and flute player from Co. Limerick. She has contributed to most of Comhaltas Ceoltóirí Éireann’s educational activities in a voluntary capacity for almost twenty years and is continually active in the teaching and playing Irish traditional music nationally and internationally. Bob Newton teaches and lectures on the musical traditions of the Celtic world to traditional and non-traditional students and general audiences. His PhD research at the University of Wisconsin-Madison was based on two years of work with local musicians and bards in Mali, West Africa, where he studied contemporary performances of their epic. He has explored and performed traditional music of several Celtic nations over the past twenty-five years, and teaches Celtic music in four different structures: online, regular university courses, youth weeklong summer camps, and adult night classes. Frode Nyvold has worked as assistant professor at the Department of Folk Culture, Telemark University College, Rauland, Norway, since 1986. Educated as a social anthropologist at University of Oslo, besides working with Norwegian traditional music he has also done fieldwork in France and Hungary. A singer since the 1960s, he has performed widely in Norway and abroad, and focuses on music, identity and communication as the main theoretical themes in his fieldwork and written work. He teaches singing and melodeon at the Department of Folk Culture at Telemark, where cultural politics and cultural history are his main theoretical themes. He is also coordinator of the Nordic network of third level folk music educations – Nordtrad. Nollaig Ó Fiongháile is a musician, researcher and lecturer, and works as Music Officer with the Arts Council of Ireland. With a BMus degree from the National University of Ireland, Cork, she is also holds and MA in Ethnomusicology from Goldsmiths College, University of London. She has managed and participated in projects at local, national and European levels. She has managed third level educational programs in traditional music, lecturing with the Galway-Mayo Institute of Technology in the Heritage Studies Department, and was Submission Coordinator with the GMIT for the development of a National Diploma in Applied Music. She is currently active in developing national and European projects in traditional music, has worked as a Council of Europe Consultant, and is a founder member of, and member on the executive of, both the Traditional Music and Dance Development Network and the European Network of Traditional Music and Dance. Conall Ó Gráda was born in County Cork into a family background Irish Traditional music and culture. He began to play at an early age, and under the expert tutelage of Mícheál Ó Riabhaigh won several All Ireland titles on both tin whistle and concert flute. In 1991 his solo album “The Top of Coom” received significant popular and critical acclaim. Following fifteen years in the electronics industry, with fellow musicians Eoin Ó Riabhaigh and Kevin Glackin he founded Scoiltrad, the world’s first interactive, internet-based music school. He teaches performance on flute at University College Cork, and has guested as tutor in other universities. Jimmy O’Brien Moran was born in Waterford, taking up uilleann pipes at seventeen, learning first from Tommy Kearney, later from Pat Mitchell at the Willie Clancy Summer School. He taught at the latter after 1977 for several years, then learned saxophone in 1979 when he joined the band Scullion with which he played for a year, touring and recording an album. He has played and taught in various parts of the world, including North America, New Zealand and Europe. He first recorded in 1978 on an album of young pipers entitled “The Piper’s Rock”, then in 1996 produced a CD of solo piping ‘Sean Reid’s Favourite’. He studied music in WIT (then WRTC), completing a BA in 1992, going on to lecture there for a number of years. Now researching for a Ph. D. at UL, he has lectured at summer schools and tionóil at home and abroad, and is an occasional contributor to the bulletin of Na Piobairí Uilleann and the journal of the Sean Reid Society. Muiris Ó Róchain was born in Dingle, Co. Kerry. His family are from the Gaeltacht, and he was reared bilingually; in younger years he was involved with music, song and local traditions such as the wren. He collected folklore for UCD from the last of the Gaelic storytellers while teaching in Cahersiveen and Waterville, and was involved in setting up Ballinskelligs Local Development Co-op in 1968. He taught in Dublin from 1967 where he was an associate of Breandán Breathnach, John Kelly, and other major figures in traditional music revival. Married to Úna Guerin of Miltown Malbay in 1970, he moved there to teach at Spanish Point. A contributor to CCÉ’s Treoir magazine and involved in Dal gCais magazine from its inception, he played a leading part in the making of three short films – My Own Place (RTÉ, 1980, prod. Tony MacMahon), Cur agus Cúiteamh (RTÉ, 1990, prod. Cathal Goan), Up Sráid Eoin – The Story of the Dingle Wren (RTÉ, 1991, prod. Ríonach Uí Ógáin). The original proposer of the Willie Clancy Summer School, he drew up its first programme in 1973 with Séamus MacMathúna of CCÉ and has been its director since. Mícheál Ó Súilleabháin is a pianist and composer, Professor of Music at the University of Limerick. Well known for his integration of traditional and classical musics while lecturer in the Music Department of University College, Cork between 1975 and 1993, a talented composer and performer, he has eight albums of music and has produced a further five recordings with Donegal, Shetland, Irish America, Cape Breton Island and England-Irish musicians on the Nimbus and Real World labels. He established the Irish World Music Centre at the University of Limerick in 1994, scripted and presented the 1995 television series River of Sound. His doctorate on the music of Tommy Potts is from Queen’s University, Belfast where he studied under John Blacking. His publications cover Irish traditional music studies, and he was assistant editor to the late Aloys Fleischmann’s Sources of Irish Traditional Music, published in 1999. He has been chair of the board of the Irish Traditional Music Archive and of Clare Music Education Centre (Maoin Cheoil an Chláir); he is a member of the board of directors of the Irish Chamber Orchestra. A frequent performer of his own work with the Irish Chamber Orchestra he has made several recordings with them, including Becoming features a film score for the 1925 silent film Irish Destiny. Stan Reeves plays button box in a dance band. He has worked for 30 years in Community Development and has integrated the methods of Paulo Freire into the teaching practice of the Adult Learning Project and the Scots Music Group. He founded the Scots Music Group, the Youth Gatherin, and the Scots Fiddle Festival, alongside volunteers from the community. He is the author of “If can’t dance it’s not my revolution” in Papers from the Fourth International Conference on Adult Education and the Arts (1995). Slominski, Tess; fiddle player, teacher, and freelance writer. She founded the Blue Ridge Irish Music School in Charlottesville, Virginia in 1999. Sally K. Sommers Smith is a traditional Irish fiddle player who has been influenced by Laurel Martin, Séamus Connolly, Kevin Burke, Tommy Peoples and (in the Cape Breton tradition) John Campbell. She works as a cellular biologist at the College of General Studies at Boston University, and has done sabbatical work in traditional music under Mícheál Ó Súilleabháin at the IWMC, University of Limerick. She has contributed essays on traditional music to Eire-Ireland, New Hibernia Review, and The Recorder, and was a contributor to The Companion to Irish Traditional Music. Last year she published on the interpretation of Irish music in the context of revival of the Irish language, and she is a regular reviewer of traditional recordings for Irish Music magazine. She participated in the first Crossroads Conference in 1996, (on the influence of the individual voice in traditional Irish fiddling), and in 2002 formulated a 4-credit course in Irish traditional music for undergraduate students at Stonehill College in Easton, Massachusetts. Barry Taylor plays the fiddle and concertina, and since 1976 has been researching fiddle music with an emphasis on the processes involved in passing on technique, style and repertoire. He is presently conducting research into the development of the céilí band, and into the musical traditions of south-west Clare. His published works include: The Irish Ceilidh Band – A Break with Tradition?, Dal gCais Vol. 7.; The Fiddler from Kilfarboy: A Profile of J. P. Shannon, Dal gCais Vol. 8.; The Tulla Ceilidh Band, Dal gCais Vol. 9.; Traditional Fiddle Playing in West Clare: Junior Crehan and Michael Downes (unpublished dissertation for the degree of Bachelor of Arts: University of Leeds, 1977) [for an abridged version, see A Contrast in Styles; Dal gCais Vol. 4]. ; The Willie Clancy Summer School: A Lifeline for the Tradition (unpublished dissertation for the degree of Master of Arts: Bath Spa University College, 1998; due to be published as A Touchstone for the Tradition – The Willie Clancy Summer School (Brandon, July 2003 [with Tony C. Kearns]). Barry Taylor has also presented a number of key lectures: The Céilí Band – An Influence for Good or Bad? (1983, Clare Folkmusic and Folklore Society); Junior Crehan and the Musical Traditions of West Clare (1993, Breandán Breathnach Memorial Lecture); The Musical Tradition of East Clare and the Tulla Céilí Band (1996, Breathnach Memorial Lecture); P. Joe Hayes and The Musical Tradition of East Clare (1997, Feakle Festival Opening Lecture); The Laichtín Naofa Céilí Band (2001, Old Kilfarboy Society, Miltown Malbay); Professionally, he has worked in education in the European Union, Eastern and Central Europe, specialising in curriculum development and in the setting up and delivery of open/distance learning programmes. Johanne Trew was born in Montreal, Quebec of Irish parents and was educated in Canada and in Ireland. Her PhD in ethnomusicology was completed at the University of Limerick, her dissertation titled ‘Music, place and community: culture and Irish heritage in the Ottawa Valley (Canada)’. She is currently Post-Doctoral Research Fellow cross-appointed to the School of Music and Dept of Folklore at Memorial University of Newfoundland. Also active in the organisation of concerts, conferences and workshops, her research there concerns traditional music and culture of Newfoundland, with particular emphasis on the Irish and French communities; her other research interests include the Irish in Canada; French-Canadian culture and civilization; relations of place, culture and music; cultural policy in Ireland and Canada.